Holly on the left, Katie on the right in the 1790s gown and pelisse. 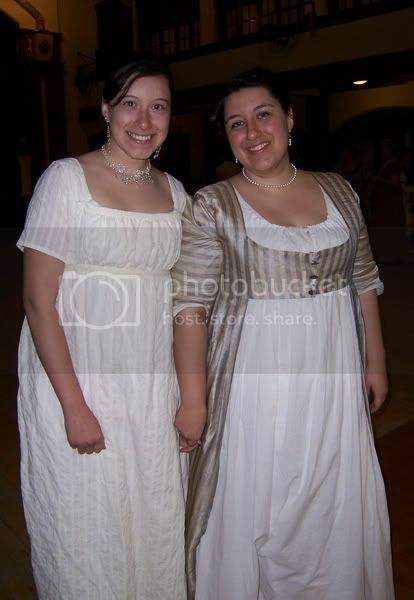 An early Regency dress for my sister to wear at the 2008 Regency Exhbition Ball in Lansing, Michigan. It's based off a 1798-1805 morning dress in Janet Arnold's Patterns of Fashion 1. I will admit that this is probably more like daywear of the period than an evening gown, but I'm disinclined to apologize; the fabric was chosen from my stash and completed entirely of materials that I already owned over a period of about ten days. 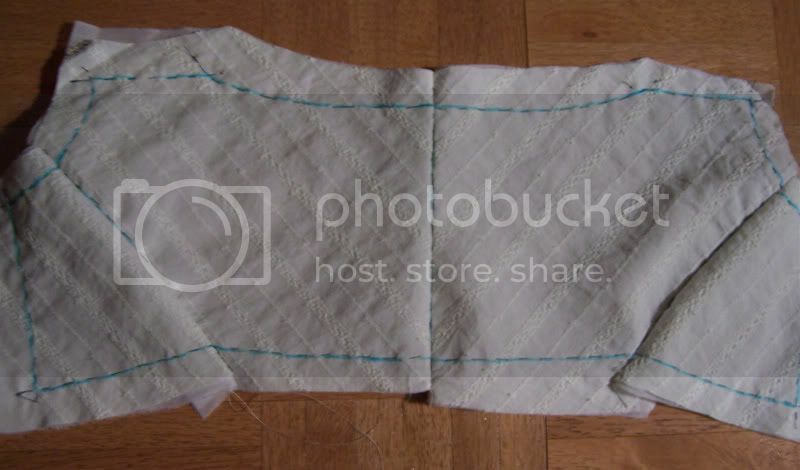 The fabric is an embroidered shirting cotton in a soft off-white color. Holly picked it from my stash once it was decided that she was to attend the ball. I'm pretty proud of the construction--I've been studying couture sewing techniques (just a little, I swear) and there's a lot of handwork that went into the bodice even though I had a limited amount of time in which to construct the full garment. The sort-of couture sewing started by marking seam lines, rather than cutting lines. That means that the lines I marked were exactly where I should sew--the seam allowance wasn't figured into them. Technically, that's the right way to do things; professional shops and couture houses never add in seam allowances on their patterns, or so I'm told. I did it slightly backwards--usually, the interlining is marked, cut, and fit first, then the fashion fabric is basted to it by hand. Since my primary concern was matching the embroidered stripes on the fashion fabric, I marked that first and then cut the interlining to match. 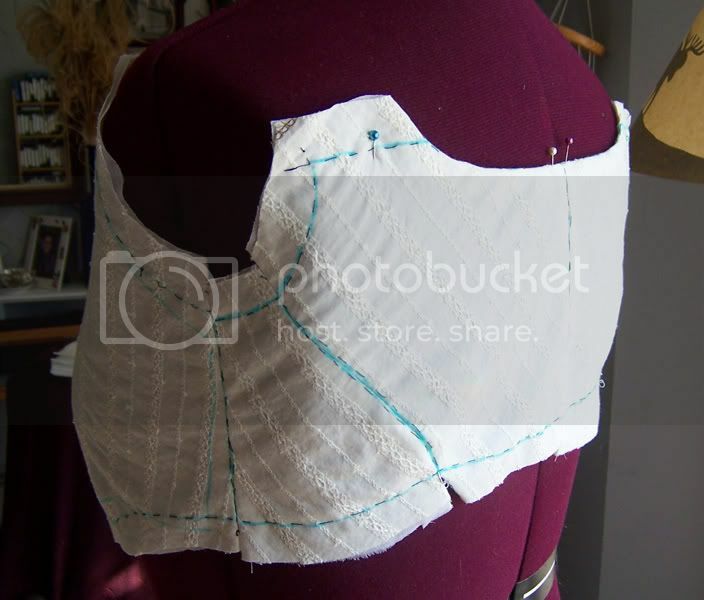 The bodice is fully interlined with cotton organdy, which, while it may seem an unnecessary step, made my life so much easier. None of the bodice pieces are cut on the straight of grain; every single one of them is at least off-grain if not bias-cut. That means that the normally soft fashion fabric is downright spongy, so interlining it with a nice, lightweight, crisp organdy kept everything under control without adding bulk. The lining is cotton twill, mostly because I already owned it and I wanted the bodice to be perfectly opaque. There was no time to make a full set of period underwear, so the dress is meant to be worn over modern support garments. 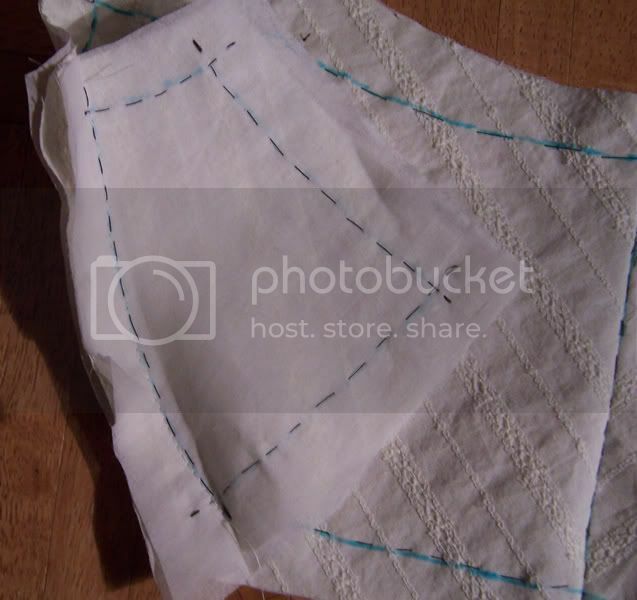 The lining was made up separately and installed by hand with a fell-stitch, which I found allowed me a greater measure of control when lining up seams and such. I'm thrilled with the result. Normally, I bag-line my garments because it makes for a nice, smooth, fray-free inside. I like my garments to look pretty inside. However, with bag-lining, the lining is always trying to slither around and roll to the outside. You don't get that problem with this method, which is legitimate because bag lining is basically the cheater machine-done way of imitating the end result of this method. And yes, when I trimmed, clipped, and finger-pressed all the seam allowances open, I then went back and catch-stitched them all down by hand. I can't claim to have done all the work on this dress, however. I was up until three a.m. the morning of the ball. Gwendolyn (Behind the Tapestry) called me earlier in the evening and in a weird reversal of roles, spent a little while talking sense at me while I indulged in a a little bit of panicking. She finished the last few bits of handwork in the car on the way to Lansing, much to my relief and eternal gratitude.